Ants evolved from wasps, and have lived on the Earth for more than 100 million years. They are found in almost every terrestrial habitat and are most abundant in tropical ecosystems. Ants like hot and humid climates. They function poorly below 68�F (20�C) and not at all below 50�F (10�C). Ants are the most highly developed social insects and live in organized communities called colonies. 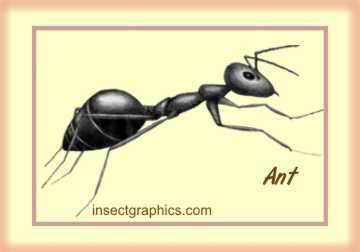 An individual ant cannot survive without its colony. Ants live as a �super-organism.� The nest is the physical embodiment of the super-organism. It is where the food is brought, the brood taken care of and the queen protected in a microclimate just right for ants. Even though individual workers may live from less than one year to more than five years, a colony can survive up to 30 years as long as its queen is alive and laying eggs. The colony is organized vertically within a nest by age and life stage. Younger ants are found at the bottom of the nest, taking care of the queen and her brood. (Most colonies have one queen, but some species have multiple queens.) Older ants take care of food stores and expand upper chambers, while the oldest ants are sent out of the nest to forage for food. Worker ants are all female. They do all the jobs necessary to keep a colony alive except egg laying. Male ants don�t do any work in the colony. They live a short time and their only function is to mate with young queens. Males and young queens have wings. A queen mates with one or more males and receives her lifetime supply of sperm, which lasts up to 26 years, during the mating flight. While waiting for the first eggs to hatch, a new queen must still get food. She lives off body fat and absorbs nourishment from her useless wing muscles. Out of thousands of winged queens only a few actually survive and start a new colony. An ant�s worst enemy is another ant. They are aggressive and attack other ant colonies. In most cases, ants from different colonies, even within the same species, treat each other as enemies. Some ant colonies have huge wars in which thousands of ants rip one another to pieces. An ant�s jaws are used to hold the legs or antennae of an enemy ant while nest mates tear the victim apart. The winners invade the defeated colony and carry off the young to eat. Ants smell with their antennae. They use their antennae to pick up scents in the air, stroke other ants, tap the ground, and examine pieces of food. Ants can hear with their legs. Organs on the legs, antenna, thorax and head respond to sound vibrations moving through the ground. Ants communicate by touch. Tapping, stroking and dancing deliver simple messages. Ants are near-sighted. Their compound eyes are made of tiny lenses that easily detect movement, but they can only see images clearly when they looks at things close-up. Ants defend their homes by biting, stinging, or spraying intruders with chemicals. Ants �talk� with chemicals. They have 10 � 20 chemical �words,� which allow them to identify ants from their own species, to attract other ants to sources of food, and to raise an alarm call in case of danger. Ants use their jaws to grasp food, carry young, build nests and fight. Ants make antibiotics. A "metapleural� gland, unique to ants, secretes an antibiotic that prevents bacteria and fungi from invading and infecting the colony. Ants can walk upside down. 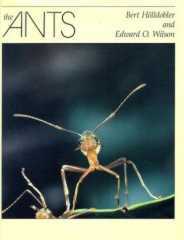 Each foot has two hooked claws, which dig into surfaces and let ants climb trees and walk on the undersides of leaves. Ants are very neat and clean. Their mouths have combs to clean their front legs and their front legs have combs to clean their back legs and antennae. Ants have social stomachs. They store liquid food in an expandable pouch called a crop. Food is often regurgitated from the crop and shared with nestmates. A worker can induce a nest mate to provide liquid food by touching the other ant�s head using its foreleg. Ants make high-pitched sounds by rubbing a thin scraper on their waist against ridges on their abdomen. This type of communication is called stridulation, and it is barely audible to humans. An ant�s skeleton is on the outside. A hard, shell-like covering protects the internal organs and supports muscles. Ants do not have lungs. Air tubes branch out to all parts of the body. Oxygen enters and C02 exits through tiny openings on the sides of the body. Ants have tiny brains. A nerve cord connects the brain to the thorax and abdomen. From the cord, nerves branch out to the entire body. Ants have simple hearts, which consist of a tube that runs from the head to the end of the abdomen. Muscles force colorless blood forward in the tube where it empties out near the brain. Ants are strong. They can carry food 5x greater than their own weight or drag prey items 25x heavier. Some ants build mounds with a longer southern slope to increase solar energy collection. The slopes are so consistently oriented that for centuries they were used as compasses by people in the Alps. Some ants that don�t have stingers spray poison from the tip of the gaster or release an insect-repelling substance that is thick and gluey. When an ant dies it simply falls over. Nest mates ignore it until decomposition begins. Then they pick it up, carry it out of the nest and drop it on a refuse pile. Eggs develop into larvae, which are protein-eating machines without eyes or legs. They grow rapidly and become pupae. In their cocoons, pupae lie motionless and slowly take on the form of a full sized adult. Thanks to the California Academy of Sciences for the use of "Ant Facts." Click here to see a video showing the architecture of an ant colony. This landmark work, the distillation of a lifetime of research by the world's leading myrmecologists, is a thoroughgoing survey of one of the largest and most diverse groups of animals on the planet. H�lldobler and Wilson review in exhaustive detail virtually all topics in the anatomy, physiology, social organization, ecology, and natural history of the ants. In large format, with almost a thousand line drawings, photographs, and painting, it is one of the most visually rich and all-encompassing view of any group of organisms on earth. It will be welcomed both as an introduction to the subject and as an encyclopedia reference for researchers in entomology, ecology, and sociobiology. Winner of the 1991 Pulitzer Prize in General Non-Fiction. Click picture of book to purchase.